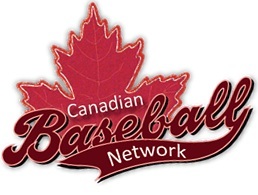 The Canadian Baseball Network has an updated Canadian draft list. 12 young players from Alberta are on the list, including 5 of the first 17. #11 - Ethan Elias - yet another RHP, this one from Entwisle who recently played on the Canadian Junior National Team, and played for the Edmonton Prospects. #14 - Sheldon McDonald, another pitcher from Spruce Grove, but he is a lefty who is at UBC. #17 - Cory Scammell an OF from Edmonton who is a product of the St. FX Baseball Academy, and also played on the Junior National Team. Dale Anderson, a catcher from Strathmore, who had previously been drafted by the Rangers out of the College of Southern Idaho and turned down a contract offer to return to school and is now at Seton Hall. A Baseball Calgary product who went on to Vauxhall, he also played with the Junior National Team in 2007. Blake Carruthers, a Calgary outfielder, playing at UBC. Brendan Hendriks from Cochrane who is at Vauxhall and also played with the Junior National Team. Burke Seifrit, the third pitcher from Spruce Grove on the list, who was drafted by the Blue Jays in 2009 and is currently pitching at Southern Nevada College.